Some rural and rare zip codes will get 3 day service. No one beats my prices!! Now, the best of both worlds. Our new GX-4i² offers every stroke-saving advantage we can pack into a compact, rugged laser rangefinder revolutionary Smart Key technology now conforms to USGA Rule 14-3 pg. Lightning-fast DNA® engine; improved PinHunter® 2 Laser Technology; and a bright, vivid OLED display come together with proprietary features such as True Golf Range (TGR®) and Club Selector. The result is a training/playing aid that can be tailored to your own personal ball-striking abilities, or used for tournament play when permitted by Local Rule. Club Selector gives you every advantage to hit the shot you need. By pre-entering your normal striking distances for the 8, 6, and 4 irons, Club Selector will then make club recommendations based on the True Golf Range (TGR) of your shot. Its like having your own personal caddie who knows your every shot. Conforms to USGA Rule 14-3. The chrome faceplate (included) disables True Golf Range and Club Selector features to make the GX-4i² permitted for use under the rules of golf (per USGA Rule 14-3/0.5). Our products are battered and abused by thousands of enthusiasts every day and they are legendary for their durability. We know how to make a product rugged and weve poured that knowledge into the weatherproof Leupold golf rangefinder. So the next time you play through an ill-timed squall, you can be confident at least one friend will stick by you side - your Leupold golf rangefinder. Rain or shine, many golfers hit the links regardless of condtitions; that's why we designed Fog Mode. Your GX will cut through the weather and provide fast, accurate measurements to get you on the green. You don't let anything stand between you and the cup, so why should your rangefinder? Pinhunter 2 & Prism Lock. The key to fast, accurate ranging is the ability to lock on to the flagstick. For some, a shaky hand has made it more difficult to get onand stay onthe pin. Our improved PinHunter 2 Laser Technology available on GX-3i² and GX-4i² filters out background images and makes zeroing-in on the target faster and easier. Three different reticle options give you more flexibility in choosing the one thats best for you. Leupold GX Prism Lock Technology combined with PinHunter 2 Laser Technology make "locking on" faster than ever before. You get an audible tone when the rangefinder finds the prism, and the distance is immediately displayed, speeding up the pace of play and giving you more confidence to hit the shot. The Quick Set Menu is intuitive and easy to use, giving you fast access to the incredible performance of your GX golf rangefinder. All features and modes are easy to see without cluttering the field of view. When you want multiple readings in one quick sweep, just hold down the Power button and the display will continuously update with accurate line-of-site measurments. As an extra benefit, on courses utilizing prism technology, your GX will beep and the display will freeze the moment you scan past a prism-topped flag stick, assuring you of an accurate reading. Many rangefinders and GPS systems can provide straight Line-of-Sight (LOS) ranging. But as serious players know, the true distance to the hole is rarely a simple straight line. Inclines, declines, altitude, temperature, and other atmospheric conditions dramatically affect your actual distance and club selection. Leupold rangefinders with True Golf Range are the only rangefinders in the world that arm you with this critical information. And, when you combine TGR with our exclusive Club Selector, you get a specific recommendation for which club to hit based on your own personal ball-striking abilities. 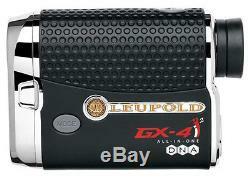 LEUPOLD GX-4i2 FACTORY SEALED BOX AUTHORIZED LEUPOLD DEALER GX4I2 SQUARED (#261644718853). 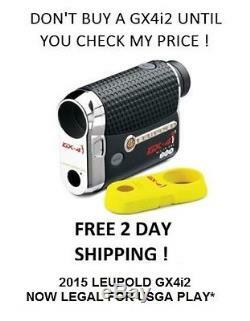 2014 LEUPOLD GX-4i2 FACTORY SEALED BOX AUTHORIZED LEUPOLD DEALER GX4I2 SQUARED (#261644718853). Exactly as described, packaged well. Will do business with again! Factory sealed box as listed. Enjoy using my Leupold GX-4i2. Excellent service and happy withthe product. 2014 LEUPOLD GX-4i2 FACTORY SEALED BOX AUTHORIZED LEUPOLD DEALER GX4I2 SQUARED (#261560719600). Arrived as described and very quickly, hope my husband likes it! The item "LEUPOLD GX-4i2 FACTORY SEALED BOX AUTHORIZED LEUPOLD DEALER GX4I2 SQUARED" is in sale since Thursday, October 30, 2014. 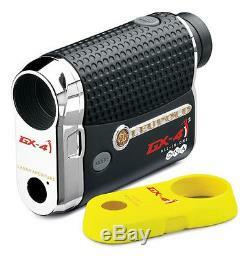 This item is in the category "Sporting Goods\Golf\Golf Accessories\Rangefinders & Scopes". The seller is "mcburt" and is located in Indianapolis, Indiana. This item can be shipped to United States.